epression is a fairly common mood disorder; you have probably met someone suffering from depression at some point in your life, or you might have even suffered from it yourself. But what is depression? Many people use the term “depressed” lightly; but depression isn’t simply being sad or moody. In order to be diagnosed with depression, a person must display certain psychological and/or physical symptoms every day for a period of at least two weeks. Depression can be mild, moderate, or severe. It can also be related to medical disorders, such as diabetes, thyroid disease, cancer, or to other mental health conditions, such as anxiety. It can happen at any age, but usually starts in patients in their teen years, or early 20s and 30s. Although depression isn’t a hereditary disease, the risk of suffering from it increases if there is a family history for the condition. The disease might be caused or worsened by an imbalance of certain chemicals in the brain. Suffering from other illnesses can trigger depression. Having another medical or psychiatric condition increases the possibility of suffering from depression. For women, depression can be related to hormonal changes, especially after childbirth or during menopause. Being exposed to stressful situations, violence, major life events, amongst others, can trigger depression. There isn’t a specific test meant to diagnose depression. Instead, your doctor will ask you about your symptoms to determine whether you are suffering from depression. It is possible that your doctor will perform a physical examination and/or order laboratory tests, in order to rule out any other disease or condition which might cause depressive symptoms. The evaluation must determine which depressive symptoms are present, when they started, a thorough personal and family history, along with any other factors which could contribute to the patient’s condition. Patients with depression usually have a positive response to treatment. However, it is important to remember that not all patients react in the same way to the same treatments. Therefore, it is possible that you will need to try different alternatives before finding a treatment that works for you. 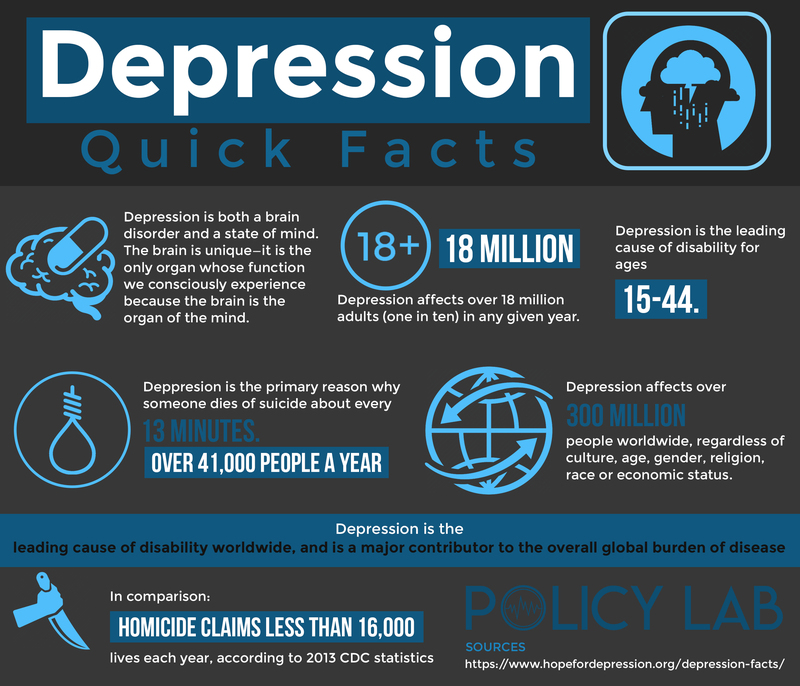 Depression is usually treated with a combination of medications and therapy. Antidepressants are meant to regulate the brain chemistry in order to relieve depression. Although some improvement might be seen after a couple of weeks into the treatment, their full effect isn’t usually apparent until 1-3 months taking the medication, and they are usually prescribed for at least 6 months. Selective serotonin reuptake inhibitors (SSRIs): citalopram, escitalopram, fluoxetine, sertraline, paroxetine, vortioxetine (approved in 2013) amongst others. Serotonin/norepinephrine reuptake inhibitors (SNRIs): venlafaxine, duloxetine, levomilnacipran, levomilnacipram (approved in 2013), amongst others. Serotonin-Dopamine Activity Modulators (SDAMs): brexpiprazole, aripiprazole. Tricyclic antidepressants (TCAs): amitriptyline, clomipramine, doxepin, nortriptyline, amongst others. Monoamine oxidase inhibitors (MAOIs): isocarboxazid, phenelzine, tranylcypromine, and selegiline amongst others. Atypical antidepressants: mirtazapine, bupropion, trazodone, amongst others. There is also some clinical evidence supporting the efficacy of St. John’s Wart as a therapeutic alternative for mild depression. However, some studies have theorized that this is due to a placebo effect, and it should not be used to replace conventional medications. Different types of psychotherapy, such as behavioral activation, cognitive-behavioral therapy, interpersonal therapy, mindfulness based cognitive therapy, and problem solving therapy are used in conjunction with antidepressants to improve the efficacy of the treatment. It might be used alone to treat mild cases of depression. Therapy can be individual, or it can involve the patient’s partner, family, or other individuals. Electroconvulsive therapy is another form of therapy, but it is usually reserved for severe depression where other therapies have failed, and the patient has a high risk of suicide. It has been shown to be very effective in these cases, and it produces improvement faster than other forms of treatment. Clinical trials are a great way to help further research regarding depression, and also to get access to care from experts in the field. Depression clinical trials are mostly carried out to determine the safety and efficacy of new medications and procedures, and they are led by a research team. A patient can obtain life-changing treatments through a clinical trial; however, it is important to note that if the patient wishes to leave the trial for any reason, they may do so at any point during the research. If you are interested in joining a clinical trial, ask your doctor about trials open in your area, or contact hospitals and universities to obtain information about clinical trials available to you. There are many things you can do to improve depression. Lifestyle changes can help maximize the benefits of medication and therapy. Eating a healthy diet: a diet rich in fatty acids (fish, nuts, supplements), amino acids (meat, dairy, some vegetables), and complex carbohydrates (grains, fruits, and vegetables) can help improve mood. It is also important to avoid drugs and alcohol. Exercise: exercising at least 30 minutes a day, three times a week can help reduce stress, stabilize mood, and improve sleep and self-esteem. Sleep: lack of sleep can worsen depressive symptoms such as fatigue and irritability. Having a bedtime routine and getting restful sleep helps improve these symptoms. Hobbies: developing hobbies which make you feel better is a good way to improve your mood. Be understanding and non-judgmental of your loved one: depression is an illness just like any other, and it is important not to stigmatize it. Learn the symptoms so that you can recognize the disease or any worsening symptoms. Get help: it is important to be aware that you might need help to deal with your loved one’s illness, too. Encourage adherence to treatment: make sure to talk to your loved one and express your encouragement, so that they don’t stop following their treatment.